What are the latest developments in the world of consumer electronics? Over the past few years, several technologies have been touted “the next big thing”, but while some categories have taken off, others have yet to deliver on their hype. Among the big tech trends of the past years, 4K or Ultra HD TVs have been most successful in turning hype into actual sales. The Consumer Technology Association, the organization behind the CES, projects 4K TV sales in the United States to amount to $15.9 billion this year, leaving other emerging tech categories far behind. 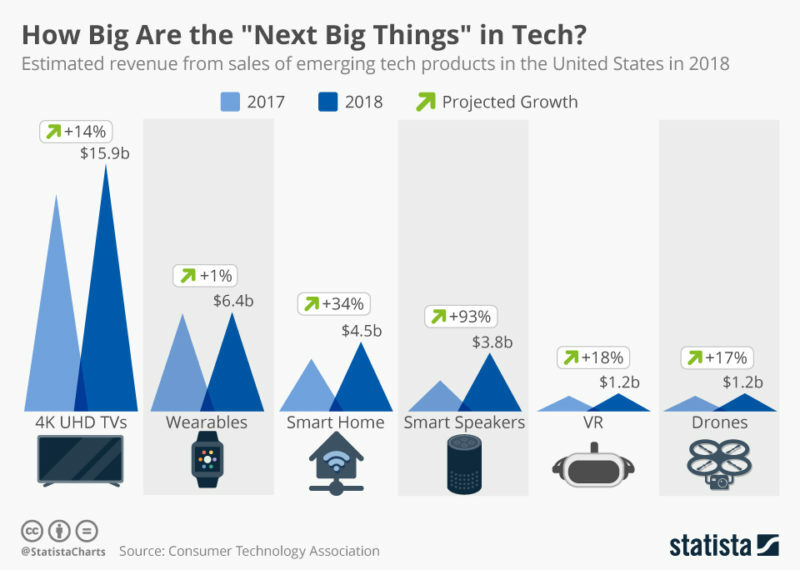 As our chart illustrates, smart speakers and other smart home products are also expected to see significant growth this year, translating into multi-billion dollar sales in both categories. Meanwhile virtual reality and consumer drones have never quite delivered on their promise and have yet to make a big impression on the mainstream audience.